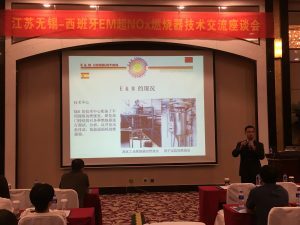 Some fifty representatives of the energy sector participated in the dissemination seminar, among which they were chemical and solar thermal energy manufacturing groups, as well as boilers manufacturers. The meeting organized jointly with its local partner was held at the Crowne Plaza hotel facilities. The participants in the seminar had the opportunity to train intensively on knowledge and theoretical skills of the industrial combustion processes and the application of new technologies that allow to optimize the operation of the facilities. Following the introduction of the distribution company in the region, led by Mr. Lv, Juergen Praest, the director of E & M Combustion China, presented the innovative advances in Low NOx technologies developed by the Spanish company and its applications to improve energy efficiency and the reduction of polluting emissions in industrial combustion plants. Later Juergen Praest made a technical communication jointly with the commercial director Kerwin Pei. E & M Combustion is a combustion engineering company with an extensive proffesional experience. It is located in the Spanish region of Artea, Bizkaia, close to Bilbao. The company is specialized in the development of innovative technologies that add value to its customers. Its equipment registers low polluting emissions and they are adapted to the needs of its customers, thus allowing greater energetic efficiency. It works mainly in the energy sector, as well as in petrochemical, oil and gas and food and beverage industry sectors. E&M Combustion is present with its equipment installed in more than 30 countries and allocates more than 70% of its production to export.